Between her runway shows at Fashion Week and designer collaborations. Between her runway shows at Fashion Week and designer collaborations, we have to ask, is there anyone who had a better 2016 than Gigi Hadid? The model, who skyrocketed to fame last year, has come into her own with an Instagram following of 26.2 million and a face (call it the Gigi factor) all designers want to work with. Not to mention, her enviable street style is also well-documented on the daily. Through it all, Gigi's managed to maintain her humble personality and sunny West Coast vibes, which is why we're 100 percent sure this isn't the last we will hear of her. In fact, it's only the beginning. As the year draws to a close, we're tracing back Gigi's top career-defining moments. Count down with us to her number one modeling moment of 2016 and then continue to keep your eyes on this 21-year-old superstar. Gigi landed the coveted runway gig for Chanel's Spring/Summer '16 show at Paris Fashion Week. On Jan. 26, the model walked in her first Chanel show alongside sister Bella Hadid and Kendall Jenner. Gigi and Zayn are no ordinary couple as evidenced by their spread in Vogue's May 2016 issue. Shot in Naples, Italy, the two rode motorcycles, made out in front of Instagram-worthy backdrops, and basically made every other couple wish their own snaps were just as amazing. The two were part of a photo shoot titled "Placebo Pets." The It models even came together for a performance-art piece and shot some behind-the-scenes snaps that proved their friendship was as real as it gets. We're pretty sure the "is she or isn't she a supermodel" debate was put to rest once Gigi walked down the runway with legendary supermodel Lauren Hutton herself. During Milan Fashion Week, the two walked arm in arm at Bottega Veneta for the fashion house's 50th anniversary. She's already a bonda fide street style star, so it was only a matter of time before Gigi designed a shoe of her own. The model teamed up with none other than Stuart Weitzman to launch the Gigi Boot, a cool combat bootie that comes in three types of finishes. From walking the runway to hosting an award show, Gigi can now say she's done it all. The model hosted the 2016 AMAs and throughout the course of the night wore so many memorable outfits, they all, of course, had to be documented. A pro by now, Gigi walked in her second Victoria's Secret Fashion Show on Nov. 30. The model wore two different lingerie outfits and looked more confident than we've ever seen her. Gigi's success as a model and style icon culminated in a cover spread for Vogue's August 2016 issue. 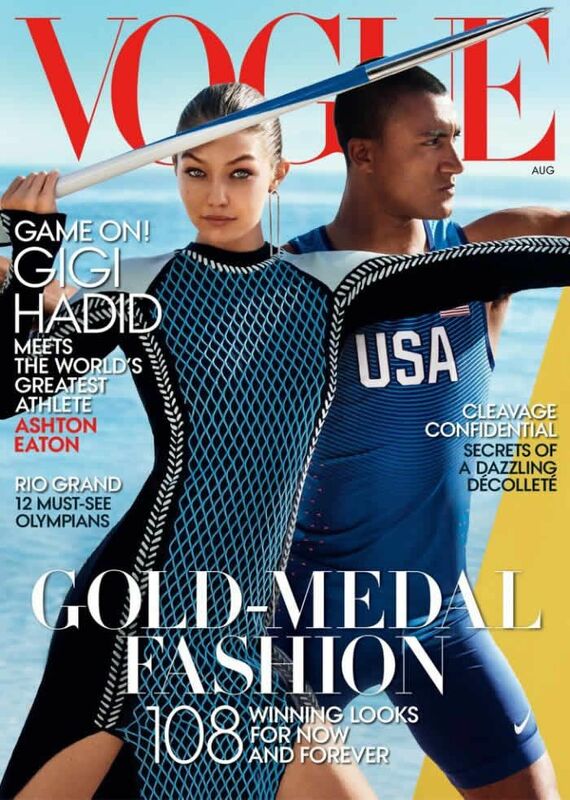 It was her first American Vogue cover alongside Olympic decathlete Ashton Eaton. If you had any doubts this was Gigi's year, just take a look at her model of the year award. She beat both sister Bella Hadid and Kendall Jenner for the honor, which was presented to her by Donatella Versace at the British Fashion Awards. For the special occasion, Gigi wore a cool two-piece Atelier Versace outfit.